As a huge music fan, it’s been fascinating to watch the music industry try to figure out how to preserve the rights of its creators (and, by extension, its own revenues) whilst harnessing the efficiencies of digital distribution. We live in a very different world to pre-1999 and it’s been clear for a long time that a new approach is required. Yet the industry has collectively shown itself time and again to be either incapable or unwilling to turn that particular oil tanker around to take advantage of new possibilities. One area that it has always struggled with in particular is how to deal with the remix. I came across a great article earlier last week on Girl Talk. Greg Gillis is a guy who plays live in big venues in front of a passionate fanbase ‘simply’ using uncleared samples of well-known tunes mashed together via a laptop. Of course, the record industry don’t usually take too kindly to this kind of thing and his mashups have been described as ‘a lawsuit waiting to happen’. And yet Greg Gillis doesn’t simply play live – he also releases albums with the material and, to the best of my knowledge, the record industry has yet to act. Here’s a question that divides some: do you think sampling is merely the theft of another’s content and has no individual artistic merit of its own? If so, how about a fairly innocuous six-second drum break from a funk track by The Winstons back in 1969. That one piece of drumming was sampled and “spawned several entire subcultures“. If you’re not familiar with it, just take a listen to some of the tracks that have used the ‘Amen Break’ (as it became known) over the years. Look closely and we are increasingly surrounded by examples of existing content having been spliced together to create something that, for better or worse, didn’t exist previously. The past few years have seen an explosion in Remix Culture, across all forms of creative content, driven by the collapse in the cost of technology required (no longer do you need a film studio to edit footage), the increasing availability of digital content to be manipulated and the simultaneous growth of file-sharing and platforms such as YouTube which facilitate the frictionless distribution of the end-product. Yet more fantastic examples of the way in which modern popular culture stands in many cases on the foundations of past creativity can be seen in filmmaker Kirby Ferguson’s series of ‘Everything Is A Remix’ videos (see Part 1, Part 2, Part 3 and Part 4). You might also have seen another great talk on the subject recently that was given by Andy Baio (@waxpancake), the former CTO of Kickstarter. Andy was on the receiving end of a high-profile copyright action when he co-ordinated the creation of ‘A Kind Of Bloop’, a chiptune remake of Miles Davis’ classic LP ‘ A Kind Of Blue’. Somewhat surprisingly, the case arose not as a result of the music itself (he diligently secured all the necessary clearances before the release) but when the owner of the rights in the original LP photograph took objection to the pixellated cover art image on the final CD. A thought-provoking talk, I recommend you watch it and check out his blog post also which he fought to be allowed to publish as part of the settlement which ultimately cost him a serious chunk of his savings. As Andy points out in his talk, exactly how should we be dealing with so many youngsters who are growing up believing that they are fully protected from any legal liability when uploading protected content to YouTube simply by adding the words ‘No Copyright Intended’? Let’s not forget that this is no small issue when the total numbers of individual uploads are north of 500,000 and continue to rise daily and the current system acts to classify each of those members of society as criminals. 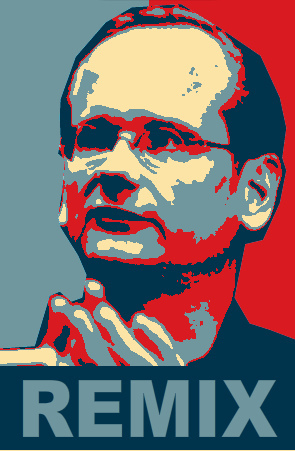 It’s a big debate, with many engaged interests and it’s prompted me to dip back into ‘Remix: Making Art & Commerce Thrive In The Hybrid Economy’ by Larry Lessig, a guy I have a huge amount of respect for. Often described as the net’s most celebrated lawyer, he’s certainly the only lawyer I’d invite to one of those fictional dinner parties you get asked about from time to time. I’ll not go into the details about the book here as I intend to revisit it in the future but if you want a quick summary of the issues surrounding remixing in a modern world within 18 minutes or so, check out his TED talk from a few years ago. For those that fancy getting into the issue in more depth, here’s the book in full (published, as you’d expect, under a Creative Commons licence from Bloomsbury Academic). I suspect that we’ll see a significant change over the next few years but to get there, society will need the input of as diverse a selection of interests as possible. Not simply the established music industry stalwarts nor the copyright abolitionists, but everyone in between those two extremes. Only then can we protect ourselves against the risk of the very real benefits arising from the creative process (financial and artistic, for individuals, organisations and society itself) being damaged to the extent that no-one wins.